Stress-Relieving Mushrooms – No Not That Kind | OhGizmo! You know if anyone has a stressful job it’s got to be Mario. It seems every few years his beloved Princess gets kidnapped and he’s forced to face a ridiculous gauntlet of mazes and bizarre creatures to get her back. So in addition to all the mushrooms he consumes during said quest I’m sure he must keep a couple of these stress-relieving foam versions in his back pocket. 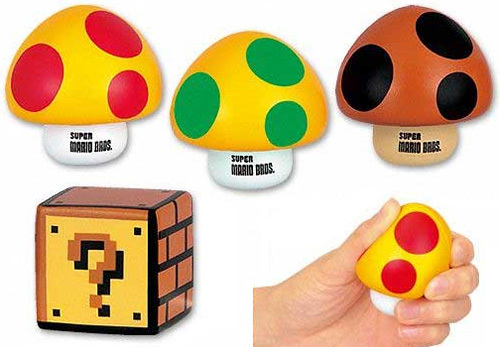 Available from Banpestro there are 4 designs to choose from including the 1-up mushroom, a poison mushroom, a super mushroom or a cube question block that’s probably just as useful for whipping at the back of a co-workers head. They’re each available for 8$ and seem to be an officially licensed Nintendo product so part of that money no doubt makes its way back to the big N.